Relieve pain and soreness where-ever you are! No Microwave – No worries! – one click and these soft easily stored and re-useable bags release an amazing and sustainable heat. To re-use, just put in a pan of boiling water and they’re ready again for next time – over and over again. Our “Across Australia” pack – for any contingency in soothing aches, pains and injuries. 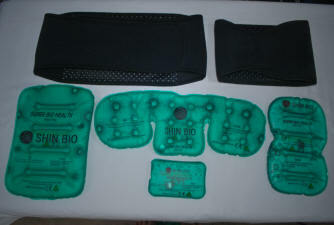 This pack consists of two Bio Ceramic belts and four heat bags. One each for Neck and Shoulder, Back, Sports and the small pocket sized bag. Ideal also for whiplash, shoulder pain, frozen shoulder, computer RSI and migraine. 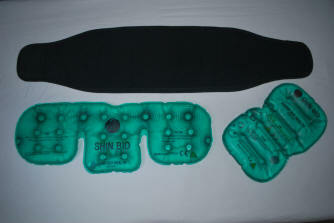 Ideal for hip replacement recovery, back pain while working, truck/taxi drivers, sciatic pains, bed warmer. Can be used with or without the bio ceramic Back Belt (included). Sports Heat Bag (25cm x 15cm) – Great for relieving pain in the wrists, elbows, knees and ankle joints. It can function as a hand or foot warmer and is excellent for treating Tennis Elbow and sore muscles. Use it inside your sleeping bag for lovely warmth on those cold nights. Ideal for Knee replacement recovery, sports injuries, arthritic joints and cramps. Can be used with or without the bio ceramic Sports Belt (included). A convenient size for the glove box or First Aid kit. Small Heat Bag (14cm x 9cm) – Little dynamos that are lightweight and totally portable. Carry in your pocket, backpack, briefcase or day bag. Ideal for use as a pocket warmer, and for spot pains, travel aches, bushwalking, golfing, bowling and many other sports. Back Belt (1360 x 225mm) This lightweight velcro belt is worn around the waist for lower back pains or at the front for period pains. Fits all sizes up to XXL, and even a pregnant belly. Sports Belt (600 x 170mm) This second lightweight velcro belt partners perfectly for use in relieving painful joints like wrist, elbow, knee and ankle. Free gift included in each pack. Re-use many times over. After each use place the bags in boiling water for around 10 – 15 minutes, and they are ready for next time.